Mona (our third crew member) joined us on our trip south from Deltaville, VA. She spoiled us with a big batch of Mona Cookies. The marina we stayed at (where the Coast Guard towed us) was great. Deltaville VA has a lot of marinas but the town is really lacking. They really have nothing at all to offer tourist other than boat yards. The town is an ideal location for boaters moving up and down the bay as it is on a peninsular and has safe protected anchorages. Mona arrived and we knew the weather was going to be iffy. We hung about for a day and saw a small window to get south to the entrance of the bay. 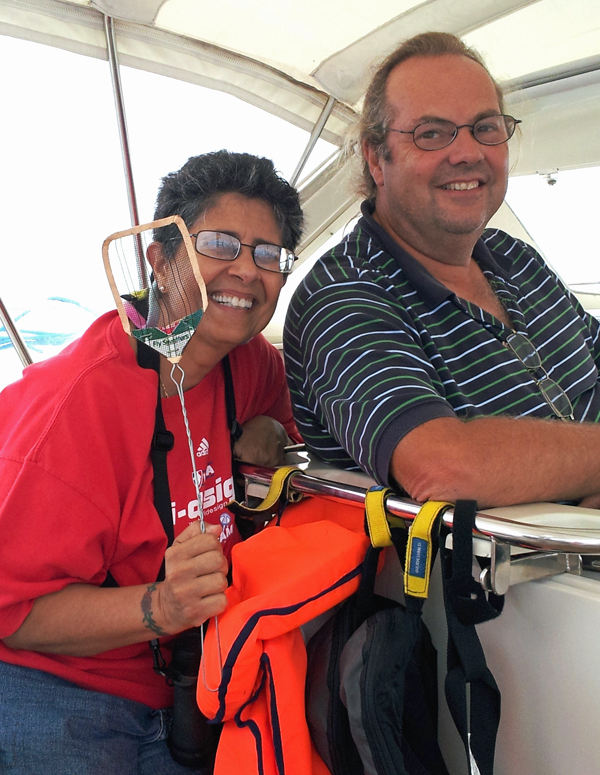 We had a great sail and Mona joined the “Winds over 20 knots club”. We also made her the official chief executive fly killer. Yes, those darn pesky flies are still around! I was introduced to flies that bite people when I first arrived in the United States many years ago in New Hampshire. I mean, these flies seriously bite. They hurt. I have always referred to them as horse flies as this is what we called flies looking like this in England. The British flies were polite little flies with cute English accents and were happy enough hanging around horses and cows. British horse flies don’t chase people and eat them. They do not stalk people, back them into corners and bite them persistently. These might be called house flies in America, not horse flies. After swatting one, I looked at it through a magnifying glass and Googled it for identification. I like for these scientific articles on the blog to have accurate terminology. My fly was flat. The Google fly wasn’t flat. Seriously, I don’t really care if they are called horse flies or house flies. I just don’t like them biting me. I moved south away from the flies and snow. Florida; the real land of flesh eating bugs. Sorry Texas, in my book Florida beats you hands down as the poisonous and most annoying bug capital of America. In Florida, I told other sailors we planned to summer in the Chesapeake Bay area. I told them my biggest concerns in doing so were the flies. Floridians were not empathetic regarding my concerns. After all, they have bugs that kill people. From my short time in New Hampshire, I remember too well how much these pesky flies hurt when they bite. I wasn’t sure how far south the flesh eating giant flies of New Hampshire might have migrated. I do not recall being bitten by flies in Florida. I think the flies there were eaten by other nasty insects like flying roaches and giant spiders. Florida has no-see-ums. When I first heard of no-see-ums in America I thought I was having my leg pulled. After all, I’ve never actually seen one. This Brit thought they were ultra stealth mosquitoes. Or perhaps, little baby mosquitoes. The beauty of mosquitoes is the victim has a sporting chance to kill the blood seeking little bugger. They are super easy to swat leaving a little stain of blood on your clothing. Man eating flies are a different story. They are very difficult to swat. They have those fancy super optical fly eyes and can see you regardless of your direction of approach with the swatter. If you try to swat them, they just laugh at you as they fly away. Then they will buzz your head and grin like a Cheshire cat. After which; they will circle back and bite you again, and again. They are relentless, tenacious and terrorizing. My biggest fear of the Chesapeake Bay has proven to be true. The New Hampshire flies also got tired of the cold harsh winters and 3 days of summer. They moved south. They thrive here in the Chesapeake area. Over the past few months, I have had nightmares about giant flies the size of my fist chasing me with big gnashing Jaws-like teeth. No, not really. But, this would make for a good movie don’t you think?